If you haven’t generated any interest from potential consulting clients through your LinkedIn profile, you’re doing something wrong. LinkedIn gives you an incredible opportunity to network and attracts potential clients for your consulting business. There is no other network with the same access to B2B decision makers. However, most independent consultants or consultants at small firms use LinkedIn very wrong — they use it as if it were a resume instead of a piece of marketing material for their business. If you’re a consultant who’s looking to grow your business instead of finding a new job, then my consultant LinkedIn profile template below will help you start generating consulting leads through LinkedIn. Copywriting and marketing isn’t a strength for many consultants, so I’ve developed a consultant LinkedIn profile template that you can copy into your LinkedIn profile, fill in the blanks, and start using LinkedIn with confidence to grow your consulting business. Your profile is only one piece of the marketing puzzle on LinkedIn, but it is the centerpiece of the system. A sales-oriented LinkedIn profile is what will compel your prospects to connect and message you to find out more of what you do. Once you’ve positioned your firm well on LinkedIn, you can start thinking about LinkedIn lead generation — the art and science of attracting the right prospects to your profile. Start your profile by writing a maximum of 3 sentences that show your prospect that you understand a particular problem in their business. I help [target audience] [acheive business outcome] so that they can [avoid problem]. Connect with me on LinkedIn and I’ll give you a free consultation to help you [acheive business outcome]. 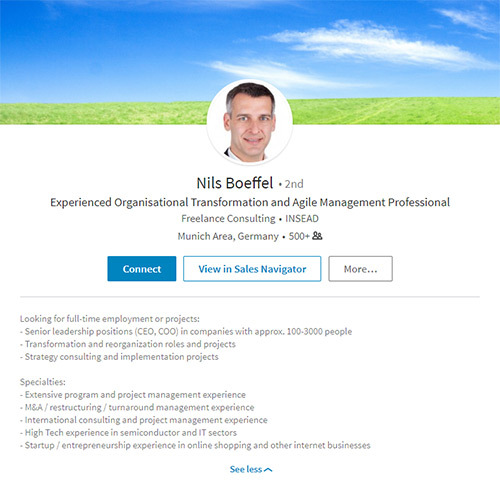 To see a live example of this LinkedIn profile template for consultants, you can find my LinkedIn profile here: LinkedIn – Tsavo Neal. If you do decide to use this template, share it in the comments below!